Fiber Flux: Free Knitting Pattern...A Peaceful Shawl! 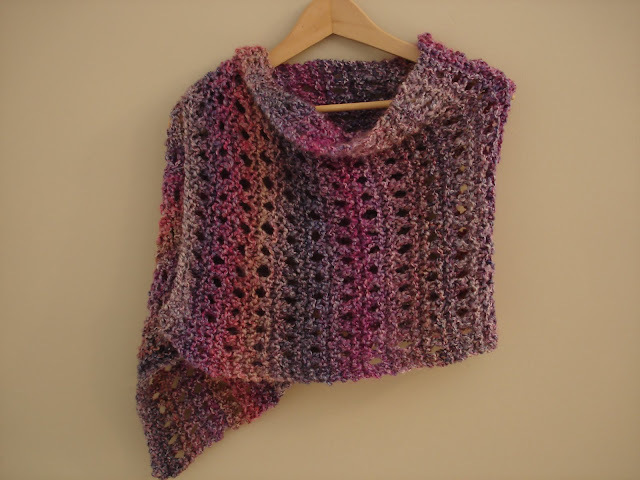 Free Knitting Pattern...A Peaceful Shawl! A Peaceful Shawl is designed as a charity project for folks to give comfort to chilly shoulders and laps. Using only a little over one skein of Homespun yarn, the result is a beautiful shawl that can be knit quickly for the people who need them. 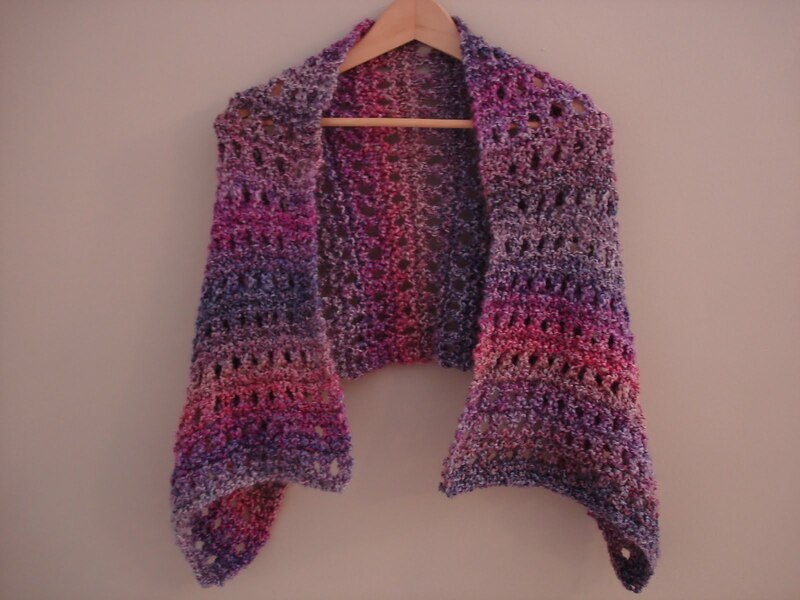 I especially loved working on this project because the shawl provides a constant warm hug and reminder that someone out there cares about them. Please note: If making this for someone who is in a wheelchair, the general guideline is that the shawl does not exceed 4 feet, as to not get tangled in the wheels. Also, I chose Homespun because of its softness, beautiful colorways and the need for these items to be easy care and machine washable. Please feel free to experiment with other yarns. Rpt rows 1-5 until about 46” from beginning. Break yarn, weave in ends and block as desired. Lovely shawl! I really like the colour. Donna, Here's a good one...I've knitted it twice, it's from lion and also uses Homespun yarn, here's the link below, good luck! Jennifer, this is exactly what I was looking for, something easy but more than just a garter stitch to knit as a prayer shawl. This is so pretty and lacy. But I'm not so busy counting that it detracts from praying! Thank you! Thanks so much, and you're very welcome...I'm glad you like it, enjoy!! this is gorgeous and very easy, that i can do it.. I love the shawl - and the pattern. I'm a beginner knitter, and I've been searching for an easy but pretty pattern to make with Homespun. Thanks for this! I'm going to try it this weekend. Will be a great pattern to share with my community outreach group! So glad you like it! Thank you and let me know how it turns out! With your permission, is it okay if I add a link to some of your projects to our site? We also like to feature a small image of featured projects in our newsletters. All credit and links, of course, would go to you and your blog. Thanks for your message, I send you a message on the AllFreeKnittting.com site. Looking forward to hearing from you too! I am currently making this. Mine does not look as wide as yours. Is 36 CO correct? When you are done you can stretch it to the desired size when blocking. how many balls does this take to knit? It took about 1.25 skeins, I used what was left over for a matching hat! Wow you have been busy! All of those precious people you are making your lovelies for will appreciate the time and love you put into each one. Happy knitting to you! Hi Jennifer!! this is a great shawl!! easy for a begginer like me!! Can i ask u how many stitches it would take to widen this up just a smidge?? How many is the pattern repeat?? Thanks! Let me check on that for you, I'll get back to you! Hi, I' so glad to find you. Thank you so much for the shawl pattern. I've been looking for a faster pattern. I need a break from the basket weave and K3,P3 patterns. 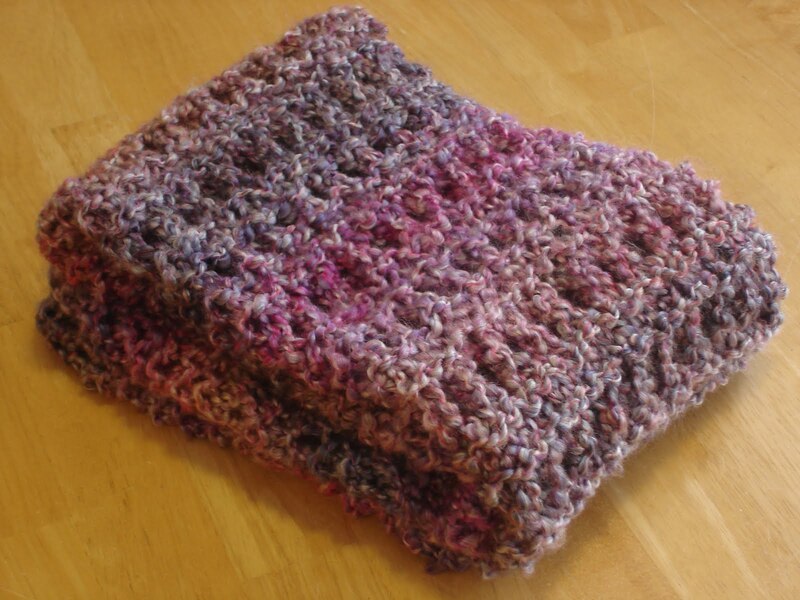 We have a small prayer shawl group and we lost someone last Spring. She was a lovely lady who made many prayer shawls and Baby blankets for our Church. Ho Mohna! Thank you so much for your kind comments! So excited for you and your knitting adventures...the yarn you will be using for the shawl sounds really pretty too. I would recommend making a little swatch with the needle size you were thinking, that way you can be absolutely sure of it will have the look you desire...better safe than sorry! When ever I make a needle size change, I do that to give me the most predicable results as possible. I hope that helps! Happy knitting! I really love this shawl and feel I can make one even though I'm a beginner as far as shawls go. As I'm not a "small" size, would it be possible to make it wider by doubling the cast on stitches to 72? Would that work? Obviously I would need more yarn also. Thought I would just check with you first to avoid making a mistake. Thank you for taking the time to share. Hi, that is a great question! As long as you are OK with the width of 17 inches being doubled then doubling the cast on would be fine. You might want to use a tape measure or measure a piece of yarn to the size you want and wrap it around your shoulders to make sure...happy knitting! Could one halve the cast on in order to make a narrower shawl/scarf? Thank you for this pattern. I have saved it so I can come back later and try it out- shawls are such useful items for so many people. This is perfect for the mill ends of homespun I have on hand. I've been looking for a pattern to take advantage of the fact the are skeins just a bit bigger than normal. Thank you! Never mind, I see a previous post says you used Mixed Berries, must be the swatch is so small - I'm going to get some this weekend and get going.- time to make something for me! Hi Jennifer, How many 50gram balls would be equivalent to the skein quantity used in this pattern? I have 36 CO and mine doesn't seem as wide? Am I doing something wrong? I'm making this for a friend for her 100th birthday. Looks like just what I need. Thank you !!!! Thank you for sharing this easy and beautiful shawl pattern Jennifer! Hi Jennifer, thank you for this easy pattern. I'm just learning and it's exactly what I'm looking for. Hi Jennifer, thank you for this easy pattern. I'm just learning and this is exactly what I've been looking for..
Love it! I was able to adapt your pattern for the 36-peg green Knifty Knitter loom by purling the 2nd & 4th rows, and making my YO with the yarn in front of the peg. Turned out beautiful in Homespun 'Fiesta' - thanks for the pattern. Looks very nice. Can it be adjusted to knit with worsted yarn??? Brilliant pattern, so glad I found it as I have a few elderly relatives and have already made one of these, it's gorgeous! Also, it took less than a week to complete! Thank you for sharing! I started a knitting ministry at my church, and this pattern is perfect. It knits up quickly and looks.beautiful every time. Love this pattern. One of my favorites. I love this shawl and I really want to make it. However, I am a beginner knitter and at row 5, I end up with three stitches at the end of the row instead of two. If I YO, it will increase the row. Please tell me what to do. Thanks. I would like to try this shawl. If I use size 11 or 13 needles, how many stitches should I cast on? How many rows should I knit? I started making a simple lace scarf a few weeks ago. It turns out to be the same pattern as yours. I am making this pattern with CO of 31 st and I plan on knitting it to 80"
This is a beautiful shawl pattern, just the right thing I was looking for to use with this self striping yarn I've had for awhile. Muito charmoso e a cor linda. I'd like to update this post with photos, and I wondered if I could use one of yours? I'd credit you, of course.